Morter claims that his treatment will correct physical (biomagnetic), nutritional, and emotional stresses. His system is taught at seminars, many of which are sponsored by the Parker School for Professional Success, a prominent practice-building organization. The system is also taught at Life College West. Membership in the Morter HealthSystem Network costs $1,749 per year or 15% less with advance payment. Morter B.E.S.T. doctors renormalize the body's energy field so that it can become revitalized. . . . In a healthy body there is no polarization of north or south energy. . . . Through (1) correct interpretation of body language, (2) complete switching with every treatment, (3) the correct transfer of energy, (4) the exact synchronization of body pulsation, (5) the correct nutritional program, and (6) sufficient time, health can be restored . Drawings from the booklet "Baby B.E.S.T. : Infant Adjusting / Care" indicate "polarity" of the fingers and the "contact points" where they are applied while the infant lies face up. The booklet also states that development and repair of the body is controlled by its electromagnetic field. B.E.S.T. proponents postulate that an imbalance in the patient's electromagnetic field causes unequal leg length, which the chiropractor can instantly correct by applying his own electromagnetic energy to proper points on the body. According to this notion, two fingers on each of the chiropractor's hands are North poles, two are South poles, and the thumbs are electromagnetically neutral. When imbalance is detected, the hands are held for a few seconds at "contact points" on the patient's body until "pulsation" is felt and the patient's legs test equally long. Proponents recommend that such testing be started early in infancy and continued at least monthly throughout life. According to a B.E.S.T. 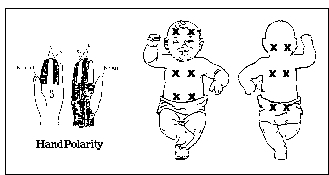 manual distributed at a 1989 seminar: (a) acutely ill infants will usually present with a left short leg; (b) colic babies will always be in this configuration; (c) this configuration indicates that the infant is functioning under reversed polarity; (d) during the adjustment the child may be under duress as the polarity returns to normal; (e) touching areas the front of the baby with the right hand will cause the right leg to "go long"; (f) touching the back of the baby will cause the right leg to "go long"; and (g) "synchronizing" the touched areas will cause all symptoms to disappear . The two principal sources of physiological toxins affecting patients are: (1) Over-consumption of Protein and (2) Imbalance of the body's timing system, caused by stresses such as trauma, toxicity and [negative] thoughts. The recommended supplements include Alka·Green (a 100% barley juice concentrate recommended as the best "overall body alkalizer"), Alka·Slim ("the only weight reduction formula designed to alkalize and energize at the same time"), Alka·Pan (a pancreatic enzyme formula "designed to reduce stress in the body and aid digestion"), and several other products . For babies, a mixture of raw goat milk, carrot juice, and distilled water is said to be "an excellent replacement for infant formulas." The supplement products are also marketed through Nutrition for Life, a multilevel company that lists Morter as a consultant. The above ideas are nonsensical. There is no reason to be concerned about the "acidity" or "alkalinity" of either the diet or the body. In the absence of serious disease, digestive and metabolic mechanisms maintain the cells of the body at their appropriate pH regardless of which foods are eaten. Unfortunately for babies, raw (unpasteurized) goat milk is unsafe because it can harbor dangerous bacteria. Morter recommends that once health is restored, patients who are interested in prevention and staying healthy should have a minimum of one spinal adjustment per month, monitor their urine pH weekly, monitor their saliva pH monthly, follow his dietary guidelines, and take his dietary supplements as recommended. A 1989 mailing stated that it was possible for a single doctor to collect over $300,000 per year using only B.E.S.T. As far as I can tell, the number of chiropractors using B.E.S.T. has never been scientifically tabulated. Morter claims to have a following of "thousands." About 800 of the 37,540 chiropractors listed in the 1994-95 National Directory of Chiropractic stated that they used B.E.S.T . Since many of the listing did not specify what the chiropractor did, and since only about two-thirds of the chiropractors in the United States were listed, Morter's estimate appears accurate. B.E.S.T is certainly one of the strangest things that chiropractors do. As far as I know, however, no prominent voice within the chiropractor profession has openly criticized it and no chiropractor has ever disciplined for using it. 1. Morter HealthSystem Web site. Accessed December 17, 1999. 2 Morter T and others. Baby B.E.S.T. : Infant Adjusting/Care. Rogers, AR: Morter HealthSystem, 1991. 3. Morter MT Jr. The Healing Field: Restoring the Positive Energy of Health. Rogers, AR: Best Research, Inc., 1991. 4. Morter HealthSystem seminars, 1998 seminar schedule. Brochure distributed in 1998. 5. Morter HealthSystem presents the new healthcare system. Brochure distributed in 1994. 6. Morter MT Jr. B.E.S.T. Rogers, AR: M.t. Morter, Jr. ,1980. 7. Morter MT Jr. Your Health Your Choice. Hollywood, FL: Fell Publishers, 1992, p 2. 8. Nutritional supplements with a healthy difference! Specifically designed to alkalize the body. Information for doctors only. Rogers, AR: Morter HealthSystem, 1992.The Web site contains similar descriptions. 9. National Directory of Chiropractic, 5th Edition 1994-1995. Olathe, KS: One Directory of Chiropractic, Inc., 1994. This page was posted on December 17, 1999.